In recent years, the term “new Berlin” has become a casual reference to cities speculated to be the next up-and-coming. Like a discovery flag planted to signal the promise of cheap rent, hip scenes, and undug potential—characteristics of 90s Berlin that tend to get attention. And so, with its rapid developments in several visible sectors, Athens was inevitably tagged as such not long after inception of the phrase itself. "BERLIN IS THE, THE NEW ATHENS!" by street artist Cacao Rocks. 2017, Athens, Psirri, Greece. Photo by aesthetics of crisis. As Australia’s Daily Review reports, “Artists, collectives, new bars, farm-to-table restaurants, startups, and alternative music venues are amassing in Athens. Abandoned buildings, the scars from what Greeks simply call ‘the Crisis’, are turning into cultural spaces and homes for startups…. Artists from Mexico, Bali, New York and the cities of Western Europe are making Athens a new base.” Athens has, no doubt, been ablaze. For a city still struggling with severe economic setbacks, it could be conceived as a positive thing to be buzzed as a hot destination. Although the implication of Athens being an imitation of Berlin may not be so welcome. Whether as a direct response to the misnomer or a self-motivated effort to promote, Athenians have in various ways reasserted Athen’s identity. From sleek revamp of the THIS IS ATHENS! 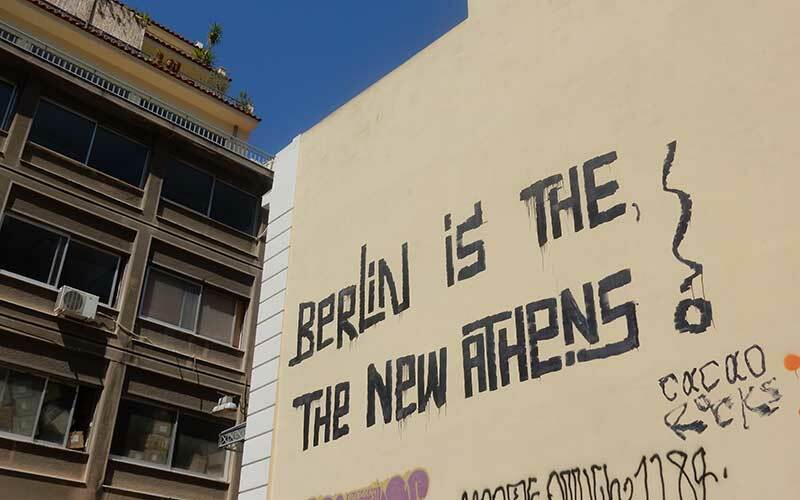 destination marketing campaign to local street artist Cacao Rocks inverting his own well-worn slogan to “Berlin is the new Athens!” (photo above), the signs are clear: Athens is shedding old labels.